According to Bloomberg it’s estimated that every minute in 2016 represents one solar panel installed. It’s no secret that solar panels are becoming popular, as costs for modules and soft goods decrease every year. The price per watt on a solar system has quickly slipped from $7 in 2010 to $3.4 in 2016 –That’s a 51% decrease in just 6 years. Now before you rush to the nearest “SuperGreen Solutions” store, keep in mind that there is more you can do before fully transitioning into producing renewable energy at home. There’s a process that is important to understand. This process is in place to prevent you from overspending and over producing energy as a result. This process is called the “Energy Pyramid’. The energy pyramid teaches us to start the process with the “low hanging fruit”, or in this case, start by conserving energy. Heating: Decrease thermostat temperature by 3 degrees, save 10% in energy. Lighting: Make a habit of turning off the lights when a room is not in use. Outlets: Unplug electronics when not in use as they each consume 2 to 10 watts. Laundry: Wash clothes in cold water to give the water heater a break. As Americans adopt energy conservation practices at home they will realize the importance of investing in energy efficiency. This brings us to the next step in the energy pyramid. The US Environmental Protection Agency defines energy efficiency as: “delivering the same (or more) services while using less energy”. This concept is adopted by retrofitting homes which is a process where households transition from energy hungry to energy efficient systems. Energy Star is the main provider for efficient systems including: LED light bulbs, heating/cooling systems, water heaters, and other appliances. Their worldwide efforts have helped “families and businesses save $300 billion on utility bills, while reducing carbon pollution by two billion metric tons”. Although adopting energy conservation practices makes a great difference, installing energy efficient products is a huge leap. For example, turning the lights on and off as a standard practice may save 5% to 10% energy on the lighting bill. However, switching from incandescent light to LED light bulbs can save up to 85%. With these two practices combined the average American household will only be using 5% to 10% of the energy compared to before. Only then will these homes be ready for the next step, energy production through renewable systems like solar and wind. Now that energy has been reduced, it’s important to think about the next step – Eliminating our dependence on nonrenewable energy sources such as coal and natural gas. These fossil fuels make up 66% of our energy source. According to Business Insider 20 cities in the US are already on track to becoming 100% renewable in the next 20 years. This goal will become a reality for most of us nationwide as awareness peaks and solar costs become more efficient. 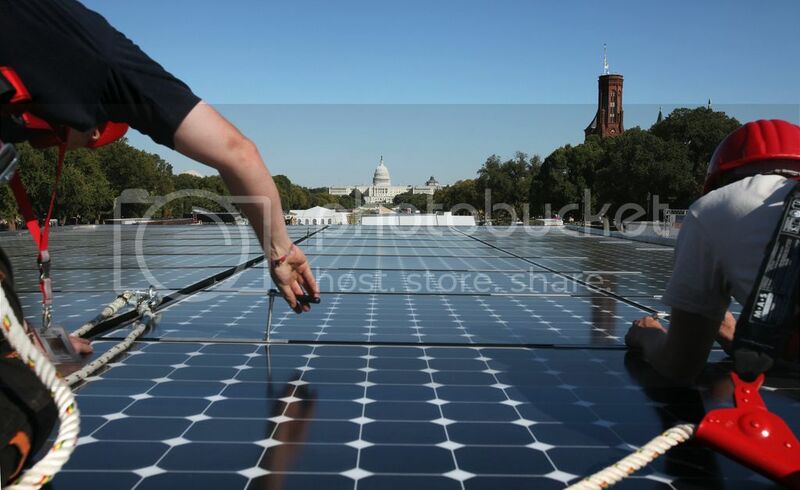 Solar companies are working on facilitating the process of switching to renewable energy. A great place to start is www.find-solar.org, there you can calculate what size solar system needed for your current energy needs, solar panel costs, available rebates, a return on investment calculator and the best solar installers in your area. It is time to adopt energy conservation, efficiency and production through renewable energy sources. It’s not only the right thing to do, but it also makes financial sense. What stands between us and sustaining the only known place in the universe that supports life, is education and implementation of renewable energy. Knowing about the energy pyramid is only a grain of sand. Now it’s your turn to share this information with someone else so that together, grain by grain we can build a sandcastle of renewable energy and better the quality of life for future generations.